Great hostel, vibe is always good. Staff are amazing, especially Tim even though the stupid bint spilled his beer all over my human. However come here if you’re looking to have a good time and meet new people. Ps Rara is hot. great place to stay, the vibe is really nice if you wanna meet new people. Really enjoyed staying here. The happy hour was great. I didn’t try the food menu and regret that choice so much- the smoothie bowls and veggie burger looked dopeeeee. I did have the family dinner a few nights which was great. The beds were so comfy and everyone was wonderful. I felt very very safe. would highly recommend!! A must stay if you are in Seminyak. This is the place if you want to socialise and party with your fellow travellers. The common areas include the bar/food area, pool and rooftop ; these are great places to hang and mingle. La Favela is also a short distance walk if you want to kick on to party!! The in-house bar and food is reasonably priced. All-in-all I would highly recommend this stay. This place is definitely worth the money. 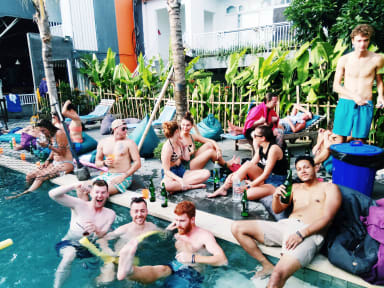 It’s relatively inexpensive, the beds are actually comfortable, so are the pillows - the facilities are great, there’s a tv with movie options, a pool, a bar, and a restaurant on site which has great food. I have a severe nut and peanut allergy and the restaurant was fully able to accommodate it. The only thing I would say is that it is about a 20 minute walk minimum to the beach and the pool clubs, but very close to the other clubs and store. The room was poorly ventilated and each pod had a bad smell of damp, which you could also see on the ceiling. The sheets were dirty in places. The locker didn’t lock. The place has a good atmosphere and is good to meet people and you can get free ‘shots’ (not much alcohol in them) the bar is cheap but the drinks are very watered down. You’d have to get a taxi to most bars & the beach. The security is limited guests who came back drunk were aggressive and nobody was at reception to help.